Michael & Michael have trouble with two comics from a rival sketch show. Michael and Michael try to help the unlucky-at-love Marla get a date. Even advertising this show during South park will not save this show from it's inevitable cancellation. 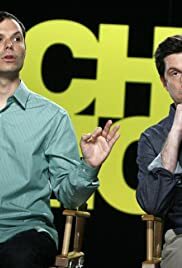 The show is not funny, the content is not funny, the writing is not funny, and the stars of the show are just annoying. Comedy Central really failed with this one for a few reason's. Totally unoriginal content being portrayed by comedian's who do food commercials is fail. After giving us comedy staples such as South Park, Reno 911, John Stewart, Steven Colbert, and the most recent success of Sarah Silverman they give us this? Give the show two months and gone. Don't waste your time here. If this is Comedy Central's response to "Tim and Eric's Awesome Show Great Job" they are way off. 10 of 96 people found this review helpful. Was this review helpful to you?